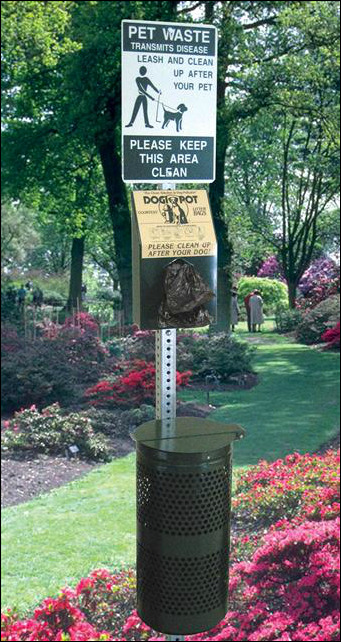 Dogipot Stations - Best Litter Receptacles Inc.
Keep your parks and neighborhoods clean. "Clean Solution to Dog Pollution"
DOGIPOT has the premier commercial duty dog waste removal system on the market to meet our customers' needs. our best selling DOGIPOT Pet Stations stand out from all other competitive products on the market as the highest quality, most economical and practical tool to motivate dog owners to pick up after their dogs and keep all dog friendly areas free from dog pollution. The presence of DOGIPOT Pet Stations will help keep your parks, recreation and common areas, and our environment clean and beautiful. • Shipping Weight: 45 lbs. • Shipping Weight: 30 lbs. The aesthetically appealing DOGIPOT DOGVALET makes it convenient for dog owners to pick up after their dogs by providing both the attractive tool (built in dispenser with capacity of two (2) rolls @ 200 bags of opaque-green, DOGIPOT Litter Pick Up Bags) and the convenient waste receptacle to dispose of bagged dog waste. The DOGIPOT DOGVALET eliminate the excuses for not being a responsible dog owner. Unlike time consuming cleaning of dog walk areas, the DOGIPOT DOGVALET can be conveniently emptied at the same time as the scheduled trash collection. This best selling item comes in a durable aluminum and economic polyethylene, and is the perfect tool to help eliminate dog pollution. • Dimensions: 40.4" x 17" x 10"
• Dimensions: 32" x 19" x 14"
DOGIPOT Junior Bag Dispensers are a versatile tool to help eliminate dog pollution. The great value and high bag capacity make it the ideal tool to encourage residents and visitors to pick up after their dogs in public parks, private communities, apartment and condo complexes, campground, RV parks, hotel yards, dog walk areas, marina common areas, and everywhere dogs go. Both the aluminum and poly versions are commercial duty, built to last, may be mounted in numerous locations and the diamond shaped dispenser openings create more resistance when pulling and tearing off the next bag from the roll for ease of use and to prevent bag waste. These dispensers have a two box 400 bag capacity so maintenance staff do not have to fill each unit as often. • Dimensions: Aluminum 15.5" x 9.4" x 3.25"
• Dimensions: Poly 17" x 10" x 3"
• Shipping Weight: Aluminum 7 lbs. / Poly 4 lbs.